UNION CITY, Ind. (Aug. 28, 2008) — The first significant answer to the market need for better fuel economy with Class A (bus style) motor homes will be launched at the annual Pennsylvania RV and Camping Show in Hershey, Pa., Sept. 10 to 14 (public days) at the HERSHEYPARK® Entertainment Complex – GIANT CenterSM. The show will introduce the all-new Avanti (which means “forward” in Italian) from Damon Motor Coach. The first motor home to be built on the W16D front-engine diesel platform from Workhorse Custom Chassis. The W16D is a 16,000 lb. 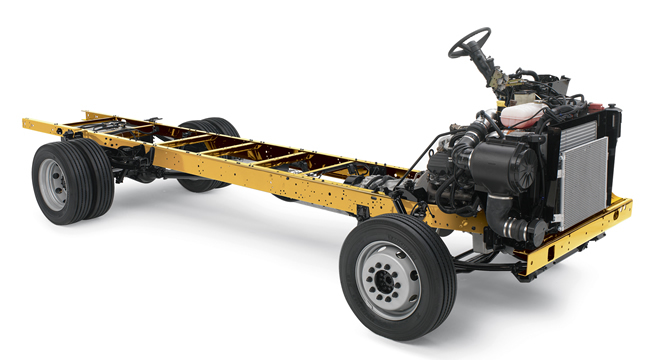 GVWR diesel powered platform that is both lower and narrower than traditional class A motor home chassis, enabling lower, sleeker motor home body designs. The initial Avanti model is 31 ½ feet long and designed to be a more fuel efficient and easier-to-drive Class A motor home. Combining a sleek, low-to-the-ground, aerodynamic design with the re-engineered Workhorse chassis, the Avanti is expected to achieve up to 70 percent better fuel economy than comparable Class A motor homes, based on internal test results. The RV-enhanced W16D chassis marks the latest in a series of chassis firsts from Workhorse that have multiplied motor home choices for consumers over the past decade. It will be on display at Workhorse Booth G by the GIANT Center along with the 2009 Chevy Workhorse Class C platform with best-in-class towing capacity. The W16D also marks the first appearance of the MaxxForce™ 5 V6 diesel engine from Navistar International Corporation (NYSE: NAV) in a motor home. The MaxxForce 5 is mated to an Allison 1000 Series transmission and produces 200 horsepower and 440 ft.-lbs. of torque. Other key W16D features that enhance the drivability and manageability of the motor home include high-performance Brembo 4-wheel disc brakes, 50-degree wheel cut and electronic instrument cluster with full instrumentation and information center. Leading edge technology makes the MaxxForce 5 a “clean diesel” engine that improves both emission levels and fuel efficiency. That and the relatively light weight of the Workhorse chassis both contribute to the Avanti’s fuel economy and payload capacity. Those attending the show on Wednesday, Sept. 14, are encouraged to stop by either the Workhorse or Damon booths to pick up a wristband for admission to a special tailgate launch party for the Avanti from 1 to 2 p.m. at the Damon booth. Hot dogs and refreshments will be served as well as some exciting giveaways, while supplies last.